The absolute best way to entice feathered friends is with water. Fresh water will attract birds who may never use a birdhouse or even visit your feeders. Bird baths have got to be the single most effective way to get more species visiting your yard. And if water does the trick so well, think about moving water in your bird baths. It’s an absolute visual magnet for wild birds! If you’re lucky enough to have a pond with fountain or waterfall, or live on a creek, you already know the difference water makes in terms of wildlife-friendly habitat. But if your landscape is dry (like most of us) there are lots of ways to create this moving water. Drippers and water wigglers are wildly popular additions for bird baths, simply because of the all the action they bring. Leaf misters are another great way to create moving water – hummingbirds and especially butterflies love the gentle spray. Here’s a net trick to make bird baths much more enticing, without spending any money at all! 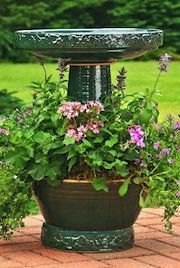 This works best with pedestal bird baths, but may also be adapted for hanging or ground bird baths as well. The bath needs to sit under a tree, as the source of slowly dripping water will come from above. Take a gallon milk jug and poke a pin hole in the lower corner, or bottom. Fill the jug with fresh water and tie it to a sturdy branch that’s at least 3 to 5 feet above the bath. Step away and watch the slow dripping create a visual magnet for your feathered friends! One gallon leaking through a pin hole should last at least 10 days before a refill is needed. The moving water really does attract more birds, plus mosquitoes can not lay eggs in moving water. A great project to try out for spring and summer… Happy Birding! Although you may hear it all the time, a fresh water source really is the best way to entice more species of birds to your yard. It’s so true, and once a bird bath is added you’ll be more than pleased with the results! Even in urban areas, folks still like their songbirds. If you have a small yard, or no yard – it’s no problem! If there’s even the tiniest deck or balcony, you can easily install a hanging bird bath with a metal hook that’s made just for decks and railings. It’s truly a joy looking out the window and seeing sweet songbirds’ activity. If anything can take you away from the daily hustle and bustle…it’s got to be nature! Hanging bird baths are well suited in big yards too where they may be ground predators lurking. Although birds do naturally bathe at ground level, the hanging bath gives them an advantage in this situation. In our yard there are ground and pedestal baths, and still we have a small copper hanging bird bath too. Another advantage of the hanging bird bath is that it can be used as a platform-type feeder in winter months. Many materials like weatherproof stoneware (shown here) will withstand freezing temperatures. With the large, flat area, it’s versatile enough for feeding suet, peanuts, mealworms, birdseed mixes, or just about anything you’d like to offer feathered friends in freezing months. The optimal water depth is about 2-inches for birds to bathe and wade comfortably. 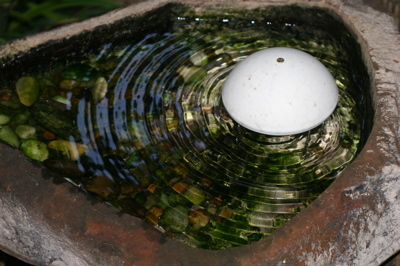 If your birdbath is deeper than that, try placing a large rock in the center for birds to perch safely. Ground bathing comes naturally for birds, and with ground birdbaths you can provide feathered friends with fresh water on warm summer days. Check daily to make sure there is plenty of water for birds to drink and bathe. Other wildlife will be grateful for the water too. 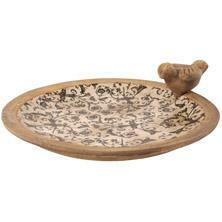 This ceramic bird bath ensures a timeless object of beauty in the garden, even when birds aren’t using it! The elegant black scroll print and aged-look ceramic gives it authentic old world charm. Please note: if ground predators such as cats are prevalent in the area, it’s best to either raise the bath a few feet up on a tree stump or table, or refrain from using this style of birdbath. Pedestal or hanging bird baths would be much better suited in this situation. New to the hobb y of backyard birding? There are numerous ways to attract more species than with houses and food. Investing in a quality bird bath is one of the best ways to attract more feathered friends to your yard. A fresh water source serves many who may not ever use a birdhouse, or perch at a feeder. In the heat of summer with severe droughts, and in frigid snowy winter months, birds need water to survive. Not only for drinking, but bathing keeps feathers clean, preened and working right! 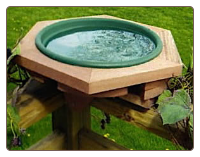 The choices can be overwhelming, and the absolute best birdbath is the one you will maintain for your birds to use. Sound silly? Not at all….heavy concrete baths look nice, I have one in my yard. But the bowl sure is awkward and heavy to dump old water. I have to brace it against my leg to do so. Also, the porous surface makes it a little harder to keep clean. Glass baths are nice, not too heavy, and very easy to clean. 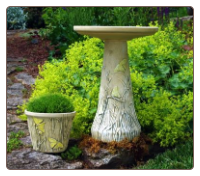 If adding a splash of color to the yard or garden is a concern, ceramic bird baths are the way to go. 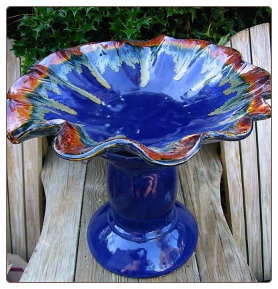 Vibrant colors in every possible style of birdbath are out there. 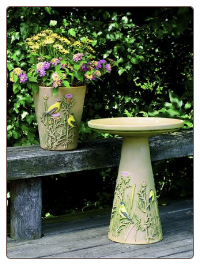 Be it hanging, pedestal, or a ground birdbath, ceramics bring a bit of functional art to any environment. 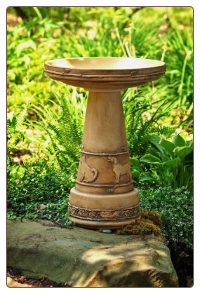 Two useful features of ceramic bird baths are these: they help keep water cooler during high temperatures, and they have the ability to withstand a bath heater in winter. All in all, they make an excellent choice for a new backyard birding accessory, as well as a great gift for any occasion. A gift that gets used everyday, lasts a lifetime, and gives back to nature is sure to bring joy to the recipient…with no worries of re-gifting!